The power of words! It is all in the presentation as long as the basics are solid. I have always appreciated this comment by the late Mr. King Jr. I have been an activist for the better part of my life but at the time the term “disciplined nonconformists” meant little to me, it just sounded cool. I was really too young (probably about 17) to understand the negativity around the word activist or the level of disdain associated with the “socialist” brand. To understand that required some wisdom and I wasn’t there yet! It was a time when an activist was the closest thing the North American society could come to declaring someone a “communist”. We were only fifteen years from the height of McCarthyism and the concept of socialists was still a little stark. Mr. King had the wisdom to recognize the impact of terminology and used it to advance the civil rights movement. Civil rights are the backbone of any accessibility issue. It is the very protection of civil rights that ensure ALL people access to everything from buildings to service to an equal society. Mr. King recognized the importance of phraseology and applied it well in all of his speeches. I would like to say King had the wisdom of his years however maturity, not age, is a better barometer when it comes to measuring wisdom. Plus Mr. King was only 39 at the time of his death. 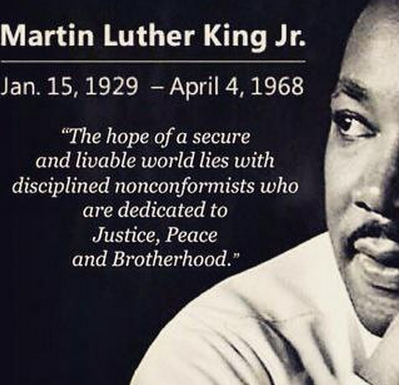 His generation of “disciplined nonconformists” paved the road for the activists of today. They were demanding the application of civil rights to be equal across the land, in other words access to everything the privileged were already enjoying. Children’s activist and Nobel prize winner, Malala Yousafzai, just turned 18. She, like so many activists, exhibits wisdom far beyond her age while presenting herself in a very mature way. Malala has become the poster child for the term “disciplined nonconformists“. She has overcome horrendous obstacles while advancing her cause worldwide, basic access to education for all women. Not only does she recognize the problems, she has experienced the resistance in her own painful way. She was able to turn that tragedy into a positive by galvanizing the world behind her cause under risk of further threats. Malala didn’t just highlight an issue, she offered solutions. Solutions that required a change in our thinking and how we view the world but they were solutions. An activist doesn’t just identify problems, they offer solutions. Too often we confuse advocacy for activism but there are differences. Anyone fighting for access to meet their personal needs is merely (and that isn’t meant to downplay their importance) seeking resolution to a specific problem. These are community advocates. An advocate tackles a specific problem then moves on with their life (I know a very simplified explanation, my apologies in advance). An activist strives to understand the complexity of their issues. They look for solutions that will accommodate society as a whole. They don’t have time to be reinventing the wheel and if the rules are already in place then why fight the issue again. An activist uses the tools available (regulations, policy, etc) and ensures the source of the issue acts in accordance with those rules and regulations. Strategies and allies are important tools for an advocate. The need for a strong network cannot be understated. Historical knowledge of how we arrived here, public policy and government regulations are all tools of an activist. Access is fluid and complicated by the subjectivity created by the current social or cultural mores of the times. If you are lacking in these areas then you are just using the “meeting my needs” type of thinking and that just keeps the problems smouldering. “Meeting my needs” thinking is usually a time limited exercise. True activism is a life long challenge. This is why activists remain engaged. The continued engagement of Martin Luther King Jr is his legacy. Malala is engaged because she has become a symbol and she has the wisdom to use it properly. Anybody having had the pleasure to listen to any address from Malala will also recognizes how she applies the right terminology. Don’t quote me here but I have never heard her make a negative comment about her attackers while being a very passionate speaker regarding the rights of women. She has become the embodiment of the “justice, peace and brotherhood” declared in Mr. King’s statement. Malala also tapped into the power of Mr. King’s legacy. She has used the words “Justice, peace and brotherhood”, I believed, in a number of her personal appearances. But then some concepts are timeless. And whether or not its Martin Luther King fighting for access to civil rights or Malala fighting for access to education they are both fighting for “access”. The concept of access is an old one but one that is continually changing. Solutions are relatively new. Almost every solution to a societal believe is driven from some form of naturally occurring aspect of the human condition. Traditionally hope. This process can usually be looked at as a social experiment and as society grows so grow the size of social experiments. I will be doing further articles around the whole concept of accidental social experiments but I won’t get into it now. I have been an access activist most of my life. Access of one kind or another. First it was access to my community following a childhood in the Children’s Hospital. The cornerstone of my belief to access is based on getting into the community. Then the issue became one of accessing the physical structures of the community. Like schools, recreation centres, government buildings, rental property’s etc. We are long past the days of The Secret Garden. We spend twenty years developing a concept of accessibility based on physical needs. Now we have to spend another twenty years getting people to recognize accessibility as something abstract. Undo the brand! I remember a meeting in the early 70’s with some of the fire fighting community present. At the time if you were wheelchair dependent you couldn’t rent a place higher than the second floor of any apartment. The fire fighters concern was how they could get a wheelchair out in the event of a fire. My response was quite simple, let’s find a way to get us in there before you start worrying about how to get us out. Those consultative meetings eventually resulted in amendments to the 1976 National Building Code. Now it’s access to employment, services, policy making, self determination, independent living and the list goes on. Physical access was concrete but todays access is much more complicated and abstract. Like the ability to access the services of a library (simple analogy). You can put a ramp into a library but that doesn’t make it accessible to someone with a visual impairment. Based on the number of years I have invested in fighting for all kinds of access and rights I like to think of myself as a “disciplined nonconformist” rather than an advocate (although I do both). To me and my wheelchair access is about more than a ramp or an electronic door opener. In the 45 years I have been doing this to me “access is a state of mind”. An advocate will allow some infringement of previously hard fought for rights to slide and then rationalize it. An activist will be quick to remind people that we cannot afford to let the “little things” slide which is why being an activist is a life long commitment. So I leave you with a question, are you an activist or an advocate? This entry was posted in Activism, Disability, Personal Life and tagged @ABC, access, accessactivist, activism, advocacy, disciplined nonconformists, election2015, Malala Yousafzai, Martin Luther King Jr, social change, wheelchair living. Bookmark the permalink.